AT 30 to AT 225 oval wastewater treatment plants were invented to purify sewage water for blocks of houses, small villages, parts of a village, accommodation properties, restaurants, recreational properties, manufacturing factories, industrial parks. After preliminary purification of industrial wastewater with organic pollution the plants serve as biological treatment for meat processing factories, dairy factories and slaughterhouses, wineries, etc. Furthermore the purified water can either discharge into the surface or underground water, respectively it can be reused for irrigation. Biological reactor of wastewater treatment unit. 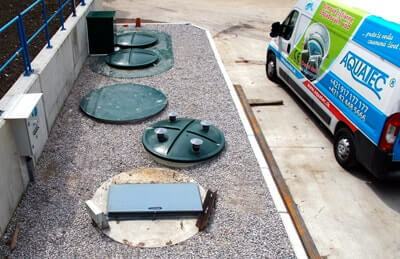 Air pump tank intergrated in the cover of the WWTP. Control unit AQC Basic with GSM remote control. Air pump or Air pumps regarding the type of the WWTP. The compact, “one-tank system” wastewater treatment plants from AT30 oval to AT225 oval are comprised of a single vertical tank with oval ground plan, made from polypropylene - the biological reactor. The dimensions of the plants are ideally suited for transporting in a standard shipping sea container or by a regular truck. The range of small wastewater treatment plants from AT30 oval to AT225 oval is designed for decentralized and semi-centralized solutions of wastewater treatment in the range of 4,5 up to 33,8 cubic meters per day (30PE-225PE). The small wastewater treatment systems comprised of the biological reactors from AT30 oval to AT225 oval can be gradually expanded up to the capacity of 135 cubic meters per day (900PE) by installing several units in parallel. The technology Vertical Flow Labyrinth – VFL®, used in the biological reactor, is protected internationally by patent. The treatment technology ensures the high quality of purified water, low investment and operation costs. Are installed into the prepared hole as underground tanks on a concrete slab with a thickness of about 300 mm so that the top edge of the revision manholes overlaps about 50 mm above the terrain. 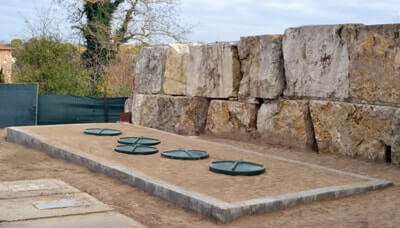 Wastewater treatment plant is self-supporting, without the need of putting concrete around. The backfill of the tanks is done with a sorted material. 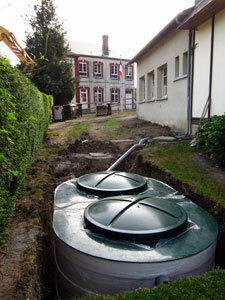 The backfill should be done by layers, while creating a back pressure by filling the water into the tank.